Throughout the first two months of the year, Asian PET producers complained of very poor margins as strong feedstock costs left most producers operating at or even beneath their theoretical production costs based on spot feedstock prices as per the pricing service of ChemOrbis. Over the past few weeks, however, feedstock costs have retreated faster than PET prices, leaving Asian PET producers operating with more favorable margins even as PET prices retreat. As can be seen from the graph, spot PET prices on an FOB China, cash basis opened the year trading with a heavy discount relative to spot PX prices on an FOB Korea basis. Outside of a single week towards the beginning of January, spot PX prices retained a premium of $100-150/ton over PET prices, suggesting that Asian PET producers were facing heavy margin pressure. Last week, the premium carried by PX over PET fell to less than $40/ton before PET prices gained a premium over PX for the first time in 2013 during the current week. These calculations are also supported by comparisons between PET prices and PTA and MEG feedstock costs. Theoretical production cost calculations based on spot PTA and MEG prices suggest that Asian PET producers were operating with negative margins throughout the most of the first two months of the year, with only a few producers offering at the upper ends of the ranges managing to maintain prices above their theoretical costs. 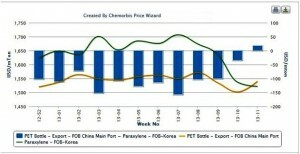 In keeping with the trends observed in the PX market, spot PTA and MEG prices have been retreating faster than PET prices over the past few weeks, leaving Asian PET producers with some additional breathing room on their margins according to ChemOrbis. Theoretical breakeven point calculations based on spot PTA and MEG prices have tumbled by just under $30/ton during each of the past two weeks, while the total loss in spot PET prices has been around $30/ton.